the time has come to fight and win! I�ll be proud, I don�t lie! Make me strong as was my father's steel! Is the sign of my glory! The invaders of my land! Sacred Vengeance lead us on our way! I swear the invader will be slain! Repent, fear or mercy we won't show! We shall repay death with death! Shall enjoy the sight of blood! The invaders hundredfolds are slain! Repent, fear or mercy we don't show! On the ground unburied they shall lay! Repent, fear or mercy was not shown! on the dead waves of the sea? when an Eternal Oath is sworn! who refuses battle by the Blade of Gods be torn! 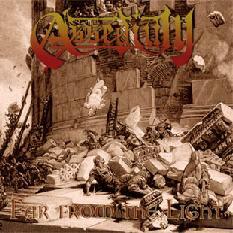 Assedium - far from the light! when the Ancient Titan is unbound! on your face an open smile! and the Eternal Oath is sworn! Our legions ride, our legions ride!